Brother embroidery machines are supplied with bobbin cases (Inner Rotary Hooks to use their technical name) which are tensioned for use with Brother bobbin fill thread. The advantage of using this very fine thread is that you don’t have to swap the bobbin for a new one as often as you would with a thicker thread. Also, because it’s always the same thickness, you can achieve consistent stitching across your embroideries when used with most good quality top threads on the market. 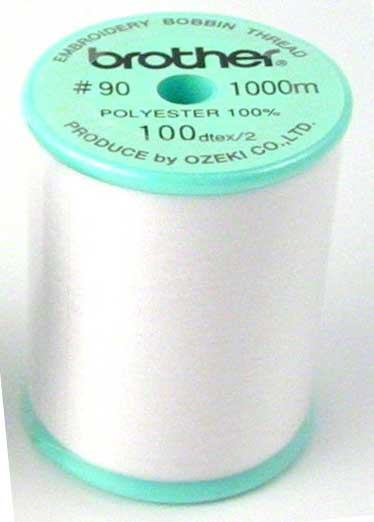 The non-shiny white thread which is on a turquoise-coloured bobbin and labelled as #90 is for use with embroidery-only machines (machines that are not convertible into a sewing machine) such as NV750, V3 etc. The bobbin case for this thread does not have green sealant on the tension screw and can be adjusted if necessary to achieve correct tension. The screw will keep its setting intact without the need for a screw sealant due to the way it’s manufactured. The shiny thread is available in white and black and is on a grey-coloured bobbin and labelled as #60. Use this with the bobbin-case that is supplied fitted to machines that are both sewing and embroidery models (NV1250, NV1500, V5 etc). 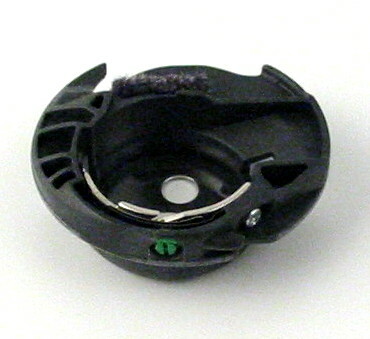 This bobbin case has green sealant on the adjusting screw and is optimised to give good tension across both sewing and embroidery providing the correct bobbin fill is used. If you use a different type you will probably experience the bobbin thread appearing on top of the fabric around the edges of your embroidery giving poor definition of the design. Don’t adjust this bobbin case. Brother have been generous with their more expensive combination machines. 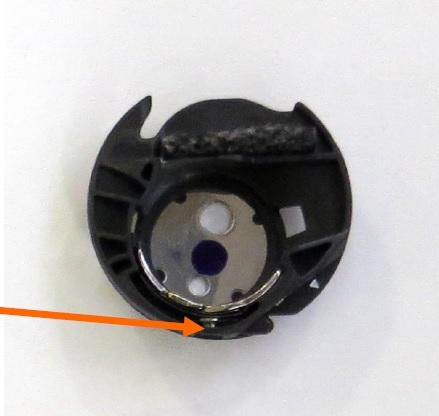 If you check your accessories supplied with your machine you will see that you have an alternative bobbin case that doesn’t have green sealant on the adjusting screw. If you decide to use another type of bobbin fill or have poor tension on the standard bobbin case just swap it for the alternative and you’ll probably find that it works perfectly because it’s tensioned tighter. It’s also the adjustable type too! Bobbin cases can become damaged and may need replacing to achieve a good stitch. Check for burrs and nicks that could catch your threads. If you have an alternative one try it and see if it cures your problem. 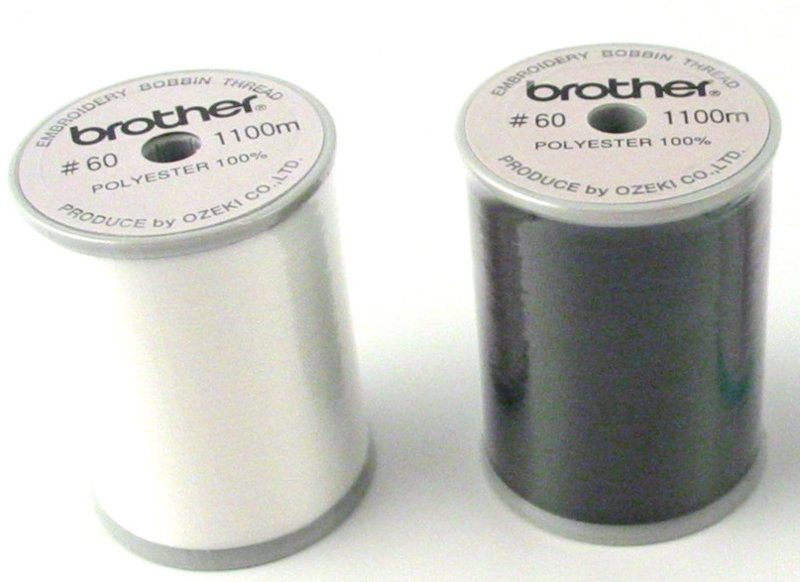 We carry all the different Brother bobbin cases in stock for replacement should you need one. And both types of bobbin fill. Ooops should have read this before commenting on another post. Sorry! Seems I should use the #90 thread that came with the V3. I will adjust the screw slightly and see if I can get the middle A you showed in the “Correct Bobbin Thread Tension for Embroidery” post. Thanks again for starting this blog – a friend put me on to it. It sounds like your bobbin thread tension was too tight Maga. When it’s like that the stitching looks ok on top but there is a tendency for the fabric to pucker more around the design requiring more stabiliser to try and correct. Please thank your friend for me haha! Keith.